How can one pass a table (as a variable or otherwise) to a stored procedure, but not as a read-only parameter? As you already know, table valued parameters can be passed to stored procedures only as READONLY parameters. So, how can one implement a scenario wherein a table needs to be passed over to a procedure, modify the table inside it and then consume the results outside of the procedure? With this method of sharing tables between stored procedures, here’s an interesting test. In this test, we are creating another temporary table with the same name within the stored procedure and attempting to manipulate it. Something did not go as expected. Had we used permanent tables instead of temporary tables, we would surely have ended up in an error because we cannot have two tables with the same name within the same database and schema. But, we did not encounter any error. What’s even more interesting is that the results returned from inside of the stored procedure indicate that the data supplied via the table outside of the procedure has not been used. We will make a small change to the procedure and the calling script as shown below – we will try to fetch the OBJECT_ID() of the temporary table alongwith the result sets. As can be seen from the results, the inner temp. table is actually a separate object, and not the same as the one used outside of the stored procedure. This is because the temp. table with duplicate name defined inside of the procedure is limited to the procedure in scope. If a table with duplicate name was not defined, the table defined outside of the procedure would still be available inside of the procedure. Do you have any other interesting observations regarding temp. tables? If so, do share them here – I am sure the entire community would be eager to hear about them! This entry was posted in #SQLServer, Blog, Imported from BeyondRelational and tagged #SQLServer on December 17, 2012 by nakulvachhrajani. Temporary tables are an external dependency. They can be particularly troublesome when connection pooling is used. SSIS also has issues with them. @Marc: Absolutely agree with you. 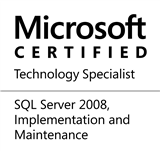 This approach is generally found on solutions coming over from the days of SQL 2000 and when teams have generally did the bare minimum to ensure that their databases work on newer releases of SQLServer (for example, a mindset like “as long as the DB can function with a compatibility level of 80 on a SQL Server 2008R2, all is well”). I have seen this create a problem with connection pooling. Today, I learnt that even SSIS faces issues with them – that’s an additional point for me to push the legacy teams towards [table valued parameters which can be passed to stored procedures only as READONLY parameters].